Increased storage of sensitive personal and commercial data along with the increase in reused or recycled IT equipment, has driven the need for permanent data erasure of hard drives and other storage devices before they are retired, resold or refurbished. Regulations of how companies perform IT Asset Disposal (ITAD) has become stricter, particularly regarding the storage, and wiping of customer and personal information. A data breach – losing personal or business information for public access – represents a serious and costly threat for any business. Not only from losing the trust of your customers, but severe punishments can result in large fines or even imprisonment. Even if you chose to send your computer hardware for disposal to an ITAD or IT service provider, you must make sure that they conform to data wiping regulations. GDPR compliance have lead the way in criteria for managing and destroying data. ZeroData Windows is the forerunner in recognizing government requirements for controlling sensitive data. Eurosoft ZeroData™ Windows® permanently and safely removes all of the data on hard drives exceeding the data destruction levels specified by major organisations and Government bodies for PC reassignment, upgrades, refurbishment, recycling and donation. A variety of companies and organizations require reliable data destruction. From ITAD and service partners providing hard drive data wiping as a service, to financial institutions, educational facilities, government, military, medical. Companies of all kinds require data destruction. ZeroData Windows drive eraser is quick and easy-to-use. ZeroData Windows boots to an easy to use interface using familiar Windows and Windows PE. ZeroData Windows can be used to reliably erase hard drives without the need to physically remove the drive. This eases the maintenance burden for IT departments by facilitating quicker cleaning and re-loading of company workstations. Alternatively, ZeroData Windows can be executed from its simple command prompt, making ZeroData Windows a drop-in-place add-on to any Windows based system management workflow. Several types of operations are responsible for reliable data destruction from ITAD and service partners providing data wiping as a service, to financial institutions, educational facilities, government, military and medical establishments to name a few. Much information held by operations is sensitive data. This sensitive data could be personal information from an employee file or private information from a medical file. This sensitive data could also be financial information such as credit and debit card account information. Would-be thieves may try to recover deleted financial data. The simple fact of the matter is that companies and organisations of all kinds must ensure that their data is reliably destroyed. 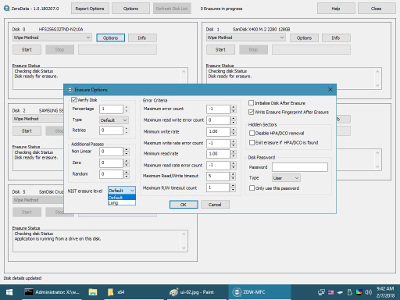 ZeroData Windows offers the flexibility to select from numerous data wiping standards, including specific SSD options. Run as either standalone or an integrated secure data erasure application with existing Windows based workflows, whether they are in Windows or Windows PE operating systems. Erasure operations provide an audit trail where each erasure step is identified using global unique identifiers and a digital signature. It is always a good idea to verify that the drive has been erased; in most situations legislation requires it. Today, it is becoming more common for companies to be able to provide an audit trail of how data is handled and disposed of when retiring or recycling storage devices. ZeroData Windows hard drive eraser includes a Self-Monitoring, Analysis and Reporting Technology (SMART) log check feature to ensure the hard drive is functioning within specified norms before and after the drive is permanently erased. 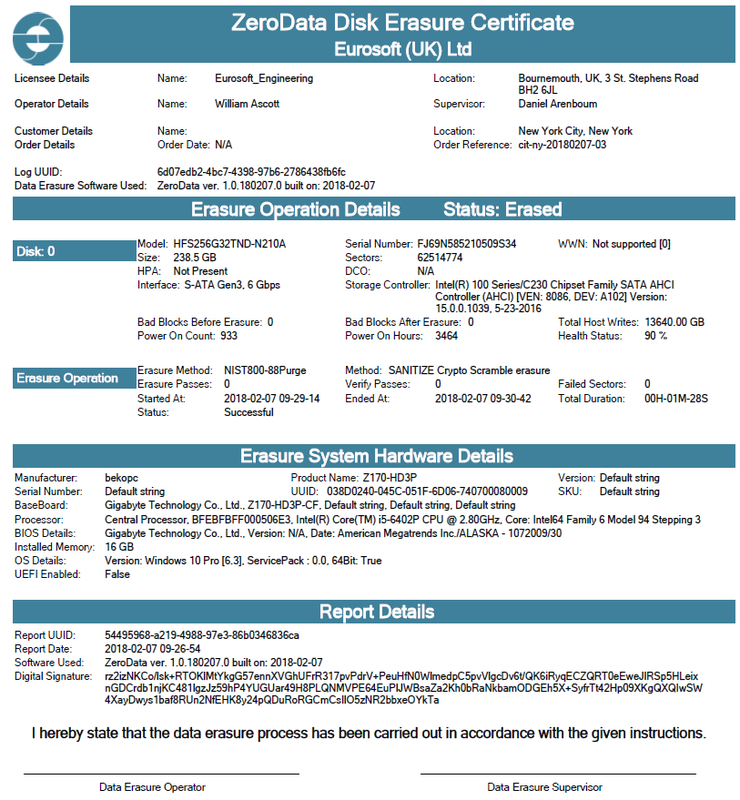 ZeroData Windows also includes full reporting and tamper proof validation certificates. These provide a permanent record of data destruction for compliance and audit purposes. Today’s workstation PCs and laptops have a combination of traditional magnetic hard drives and SSDs. There are also several other types of hard drives that are used in servers and workstations. These server drives may contain vast amounts of sensitive data. Companies need a drive eraser tool that is compatible with all the hard drives in the organisation. ZeroData Windows hard drive eraser Supports RAID, SCSI, IDE, NVMe, and CHS hard drives. ZeroData Windows also included specific wiping options for SSD drives, and supports the ATA, SCSI/SAS and NVMe firmware erasure commands. Trust ZeroData Windows for proof of permanent erasure demanded by compliance standards. Since 2002, ZeroData has ensured customer confidence with 100% data erasure. No over-managed file administration — just secure, reliable, data wiping results. Please read Which License is best for me for use on more than one PC at a time. For more information call us on the numbers below.